Julia Summers seems to have it all: a sprawling Upper East Side apartment, a successful husband, and two adorable children attending the best private school in the city. She relishes wielding influence over her well-heeled girlfriends . . . but her star appears to be fading. That’s why, when stranded in Manhattan for the summer as her crowd flees to the Hamptons, Julia is on the hunt for the next big thing that will make her the envy of her friends and put her back on top. Enter Flame, the new boutique gym in her neighborhood. Seductive and transformative, Flame’s spin classes are exactly what Julia needs—and demure, naïve instructor Tatum is her ticket in. But rebranding Tatum as a trendy guru proves hard work, and Julia’s triumphant comeback at summer’s end doesn’t quite go as planned. Tatum begins to grasp just how much power her newfound stardom holds, and when things suddenly get ugly, Julia realizes she’s in way over her head. Julia’s life is already spiraling out of control when her husband is arrested for fraud and bribery. As her so-called friends turn their backs on her, and Tatum pursues her own agenda, Julia is forced to rethink everything she knew about her world to reclaim her perfect life. But does she even want it back? 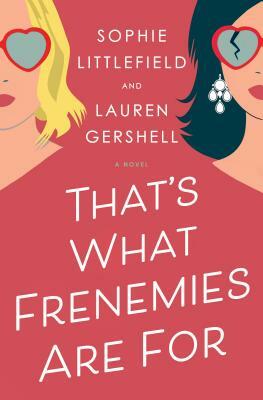 Witty and incisive, Sophie Littlefield and Lauren Gershell’s That’s What Frenemies Are For provides an engrossing glimpse into the cutthroat moms’ club of the Upper East Side. Lauren Gershell was born and raised on the Upper East Side of Manhattan, where she now lives with her family. She holds a B.A. and law degree from Columbia University. That's What Frenemies Are For is her first novel.